Now that March 2013 is coming close to being over and April is right around the corner, Spring is definitely in the air in many areas of the U.S. This is usually the time when those who are in need of a new car with a little extra zing or tired of driving a boring commuter car, begin to embark on the purchase of a performance car. In other words with winter and snow now behind us in most areas of the country, this is a great time for those who are looking to purchase a rear-wheel drive American pony car. The pony car segment began with the launch of the 1964 1/2 Mustang and soon thereafter had a wide array of competitors. Over the years most competitors fell by the wayside, but due to American automotive engineers not giving up on these cars and buyers still demanding they be produced, these cars are still alive – some would say better than ever. Though great strides have been made in performance in recent years where the current crop of base V6 powered pony cars could easily dust many of the high-performance V8 powered pony cars of yesteryear. As an example a brand new V6 powered 2013 Chevrolet Camaro will make mince meat (in all performance categories) out of a (350 CID V8 equipped) 1969 Camaro SS (the contest wouldn’t even be close). However traditionally performance oriented pony car buyers have demanded V8 power, fortunately the pony car makers still provide optional V8s at a reasonable prices. And for those that want even more power there are higher performance versions of these pony cars (or shall we call them super pony cars) which start with factory rated 470 horsepower and go all the way up to 662 horsepower. However these super pony cars start in the $40K range and go as high as $60K range which is too expensive for most buyers – we won’t even mention the higher insurance rates these ultra fast pony cars spawn. Here’s a look at the reasonably priced current crop of 2013 pony cars, all three are great buys and provide a lot of bang for the buck. What makes these three so special is that these may be the last of the affordable V8 powered new pony cars. They may go the way of the stage coach very soon with the Corporate Average Fuel Economy (CAFE) standards due to increase at a rapid rate in the next few years, it’s hard to imagine these cars will be able to offer V8 engines for reasonable prices if they get slammed with a gas guzzler tax. So if you have the means and desire to own one of these special cars, now would not be a bad time to make your purchase. The Challenger is the most non-conformist of the three pony cars. With it’s abrupt edges and early 1970s muscle car styling cues, it’s from a different era. And that is a very good thing, one complaint by many is that just about every car on the road today looks more alike then in any time in automobile history. For instance you could take a new Buick and replace the badges with Toyota badges, and most buyers won’t know the difference. Unfortunately unique styling which most cars had many years ago has been sacrificed for aerodynamics. And when every automaker is trying to continually lower aerodynamics, most cars begin to look alike. Dodge has done a great job of bucking this trend with the Challenger, they took the basic lines of the early-1970s Challenger and gave it a slight modern twist. They smoothed out a few edges and tried to make the shape as aerodynamic as possible, but styling styling was never sacrificed for aerodynamics. After-all no other automaker but Dodge would dare to produce a formal coupe roofline, these were sacrificed years ago to aerodynamics however the Challenger has a formal roofline just like it is 1970 all over again. And we are all thankful for that. However what makes the Challenger so special is adheres more than any of its competitors to the original muscle car formula where 5 adults fit comfortably and there’s a full-size car trunk space. In other words it possesses as much utility as a 1970 Chevrolet Chevelle where a family of five with a bunch of luggage can take a road trip with comfort. However the Chevelle’s large trunk was 12.8 cubic feet while the 2013 Challenger possesses an extremely large 16 cubic feet of trunk space. The Challenger in overall size is much bigger than its competition and is considered a full-size car according to today’s standards. The downside is bigger also means heavier which equates to being slower than its competition. It’s one of those catch-22 type scenarios, however the Challenger remains popular with buyers and in the final equation its bigger overall dimensions are worth the loss of a few 1/10s of a second in the quarter-mile mile since having a more spacious interior cabin and trunk make the Challenger so much more useable than its competition in the real world. Unfortunately it appears Dodge will be moving its pony car to a much smaller rear-wheel drive platform in 2015. This new pony car will be called the Barracuda (which was Plymouth’s pony car in the 1960s and 1970s), Dodge won’t confirm or deny the Challenger will be discontinued when the 2015 Barracuda arrives on the scene. However Dodge has admitted the Challenger will lose its SRT model since the Barracuda will have a SRT model. If the Challenger does survive this is a major blow losing the SRT model which currently is standard with a 392 CID (6.4 liter) Hemi V8 which produces 470 horsepower and a whopping 470 lb-ft of torque. Currently the mainstream muscle version of the Challenger is the R/T which may not have the sheer grunt of the Challenger SRT, but it’s much more powerful than the healthy accelerating 305 horsepower 3.6 liter V6 in the base Challenger. The Challenger R/T is standard with Chrysler’s 5.7 (345 CID) Hemi V8. When the late model Challenger R/T first hit the dealer lots almost five years ago, it was one of the hottest packages for the money – this was late 2008. The 2010 Camaro SS had not been released yet and the Mustang GT was powered by a 300 horsepower 4.6 liter V8. The 2009 Challenger R/T which was equipped with the 5.7 Hemi V8 made 372 horsepower and 401 lb-ft of torque with an 5-speed automatic transmission and 376 horsepower and 410 lb-ft of torque with the 6-speed manual. So you can see how the Challenger R/T back in Fall of 2008 when it was first released provided the best American pony car performance for the money – its base price was only $29,995. The good news for 2013, is that not much has changed with the Challenger R/T, it is still standard with the 5.7 Hemi V8 and believe it or not its base price is still $29,995. Everything else has gone up in price in the last five years except for the Challenger R/T. The downside is while in the last few years the V6 and SRT powered Challengers have gotten a nice infusion of more horsepower in the last few years, the R/T has stayed virtually the same – the rating is 372 horsepower and 400 lb-ft of torque for the automatic and 375 horsepower and 410 lb-ft of torque for the 6-speed TREMEC manual. A Challenger R/T hits the quarter-mile mile mark in about 13.5 seconds and 0-60 mph in low-5 second range. Which is performance that could go toe-to-toe with the best of the muscle cars from the golden era – including the legendary 426 CID Hemi V8 powered Mopar muscle cars. This is impressive when you consider the new Challenger R/T has a hefty base curb weight of 4,041 lbs. Unfortunately the problem is its main competition, the Ford Mustang GT now produces 420 horsepower and the Chevrolet Camaro SS, 400 or 426 horsepower. With the Challenger’s extra weight and slight horsepower deficit, it is at least a half of second slower in both the quarter-mile mile and the 0-60 mph run than the Mustang GT and Camaro SS. Unfortunately at this time if you want more grunt in the Challenger body style, the 470 horsepower Challenger SRT will be the only way to best the Mustang GT and Camaro SS when it comes to acceleration. 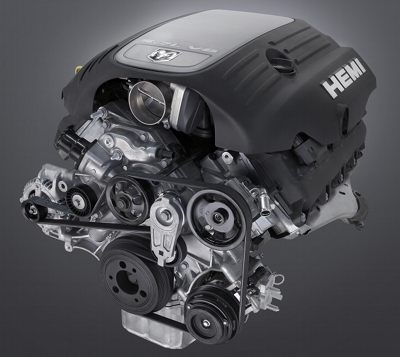 Chrysler has sort of taking a nap with the 5.7 liter Hemi the last few years, it may be it has been preoccupied with the development of the 6.4 liter Hemi and the 3.6 liter V6. Never-the-less bumping the 5.7 Hemi to around 420 horsepower would certainly go a long way in keeping the R/T competitive with the Mustang GT and Camaro SS. But don’t hold your breath, a preview of other 2014 5.7 liter Hemi powered Mopar offerings like the Grand Cherokee show no increase in horsepower for the 5.7 Hemi, so it’s probably safe to say that 2014 won’t yield a horsepower increase for the R/T. But you soon forget all this mumbo jumbo once you get aggressive with the throttle and the 5.7 Hemi thows you back in the driver’s seat like Tony Soprano just punched you in the gut – there’s no denying the R/T has more than enough power to get the job with authority.. And though the competition may have great sounding V8s, the unique engine roar and Hemi head whirling sound at full throttle, gives the Challenger R/T the nod for best sounding V8 when compared to the competition. The Challenger’s bigger size and weight also put it at a handling disadvantage when compared to the Mustang GT and Camaro SS. The Challenger R/T is still no slouch producing .89 on the skidpad handling test, however the Mustang GT and Camaro SS generate better handling performance numbers. However the Challenger R/T is a well balanced handling machine, with a 4-wheel independent suspension it handles the curves with dominance and yet is very civilized when rough pavement is encountered. The Challenger R/T is the closest in soul to the original American muscle car. Its more muscle car than pony car. Pony cars historically tended to be a little cramped especially for rear seat passengers while the bigger muscle cars offered roomier interior cabins and large trunks. Only downside to the Challenger R/T is that no convertible model is available (unlike with the Mustang GT and Camaro SS). If ever a formal roof convertible top would look fantastic on a new car, it would be on a new Challenger R/T – too bad Dodge has been clueless in this area. For the money the Challenger is the most fun along with the most practical pony car to drive. Not to mention it’s the most distinctive and most muscular in overall appearance of any new performance car on the road. Too bad it may be soon on the chopping block. So if you have been wanting to purchase one, better act fast. And for those looking for a future collectable version, the 2013 Challenger R/T Redline special edition (shown in the picture directly above) will be your cup of tea. GM only has one pony car left and it’s the Camaro – the Firebird is long gone. But it’s safe to say when it comes to overall power and handling for those on a budget, the Camaro SS is the best Camaro yet. The styling is a big hit with buyers. It’s one of the factors why the Camaro has outsold the Mustang since May 2009 (320,332 Camaros versus 287,535 Mustangs from May 2009 to January 2013). The Camaro’s styling is a nice blend of first generation Camaro styling cues and a modern muscle car. The chopped roof look which gives the Camaro very unique styling, forces the front passenger seats to almost hug the floor in order to give taller occupants plenty of headroom. This gives the Camaro a sports car like feel compared to its competition – at first the dashboard and windows seem a little high however you adapt quickly and enjoy the lower seating position. The Mustang and Challenger have higher positioned seats and both have the feel of a more traditional car in that regard. The lower seating position has one disadvantage, the Camaro has the worst outward visibility when compared to its competition. 2013 will be the last year of the current Camaro styling which was first introduced in 2009 for the 2010 model year. The 2014 Camaro will receive a mild refresh which will give the front and rear exterior a more streamlined look (the SS will get a new hood with a massive vent). Overall the 2013 Camaro has a look of a small and nimble pony car like that of the original first generation Camaro. However looks can be deceiving, even though the Camaro is smaller than the Challenger, it is a big hefty pony car that is slightly bigger than the large second generation (1970-1981) Camaro which was the biggest Camaro back in the day. You don’t realize this until you park a 2013 Camaro next to a second generation Camaro. For instance the big 1970 Camaro had a length of 188 inches, width of 74.4 inches, and a wheelbase of 108 inches while the 2013 Camaro has a length of 190.4 inches, width of 75.5 inches, and a wheelbase of 112 inches. Essentually the 2013 Camaro is larger in every dimension than a 1970 Camaro. And here’s where it gets interesting, the current Camaro with its chopped roof design appears to be the lowest height production Camaro. However the chopped roof styling is an optical illusion since the 2013 Camaro has a height of 54.2 inches which is much taller than the 50.1 inches of the 1970 Camaro. And when it comes to weight, the Camaro SS is fairly stout with a 3,860-lb curb weight which is about 500 lbs heavier than the curb weigh of the 1970 Camaro SS. 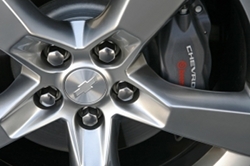 Chevrolet is planning shaving off some size and weight with the upcoming sixth generation Camaro which will debut for the 2016 model year. 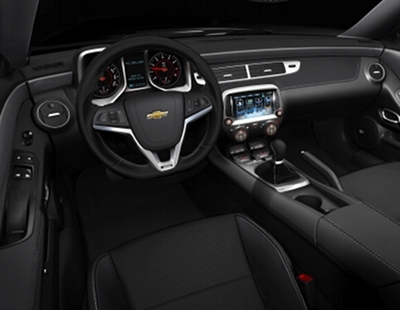 The interior of the 2013 Camaro has not changed much since the 2010 Camaro’s introduction. It’s still very appealing and just like the exterior it provides a nice blend of retro and modern styling. Inside the interior cabin all the gadgets and optional equipment you would come to expect from most modern cars is there. And finally after a few years of promises there’s now a touch-screen navigation system available on the Camaro SS for 2013 – both the Challenger R/T and Mustang GT have been available with a nav system in the last few years. In the interior, the Camaro’s seats are very comfortable. The Camaro with its large size does provide plenty of interior space for the front passengers however rear passengers like in previous generation Camaros are left with not much interior space, especially leg room. Just like most pony cars of yesteryear, adults will want to keep their time spent in the rear seat to a minimum. This is not a big deal since the pony cars of yesteryear all had the feel of a 2-seat sports car with the added benefit of a token backseat for extra passengers only to be used on rare occasions. This was the 2+2 coupe philosophy. These cars were not and even today are still aren’t suited for family duty – the Challenger is the exception. Just like the Challenger and the Mustang the base Camaro comes equipped with a V6 motor that makes just over 300 horsepower – 323 horsepower to be exact. The Camaro’s 3.6 liter V6 also possesses 278 lb-ft of torque which is plenty of low end punch. Go back 30 years and all the 5.0 liter V8 equipped 1983 Camaros produced around 240 to 250 lb-ft of torque. And you really can see how much a difference 30 years makes when you consider the base LG4 V8 in the 1983 Camaro Z28 produced a 150 horsepower which is less than half what the current Camaro’s V6 produces. And for those traditional V8 loving pony car lovers, moving up to the 2013 Camaro SS model provides a very healthy 6.2 liter V8 with 400 horsepower and 410 lb-ft of torque and the (LS3) 6.2 liter V8 with the 6-speed automatic transmission and 426 horsepower and 420 lb-ft of torque with the 6-speed manual. With the 6-speed manual SS, you can expect a quarter-mile mile time of 12.7 seconds flat at around 111 mph and a 0-60 mph time of mid-4 seconds. Don’t let the horsepower ratings fool you, there doesn’t seem to be any performance handicap for opting for the 6-speed automatic and 400 horspower 6.2 liter V8 combo – either there isn’t really a 26 horsepower gap or the computer controlled automatic transmission shifts so precise it makes up for the slight horsepower deficit. Only a horsepower measuring dyno test comparing the two, will solve this mystery. The Camaro SS is one very fast buggy, besides the Mustang GT you’re not going to find anything in this price range faster. The base price of the Camaro SS is $32,314 which is a lot of performance car for the money. Even when you load up the Camaro SS with options and rapidly approach the $40,000 mark there’s still a great performance to dollar ratio present. After-all when you purchase the 6-speed manual Camaro SS, you are buying the same 426 horsepower LS3 V8 found in the 2013 Corvette which has a base price of $49,600. If the LS3 just doesn’t provide enough grunt for your taste, Chevrolet does offer the Camaro ZL1 which has a 6.2 liter supercharged V8 that produces 580 horsepower and an incredible 556 lb-ft of torque. However the ZL1 has a base price of $54,350 which is about $22K more than the base SS, making the SS the most suited for the traditional V8 loving pony car buyer with a limited budget. Handling is impressive with the current SS’s base suspension, easily pulling a .92 g on the skidpad test. You can expect a 1.03 g (as tested by Motor Trend magazine) in the same test with the Camaro SS’s optional 1LE handling package – it’s a genuine tuned for the track suspension. The Camaro SS just like the Challenger R/T has a 4-wheel independent suspension. Chevrolet has done a nice job with the current Camaro, it has fantastic styling and plenty of power. And unlike the radical styled (fourth generation) 1993 to 2002 Camaro which was a love it or hate it Camaro for most buyers, the current Camaro appeals to all. And for those buyers wanting a V8 powered rear-wheel drive performance car for not a lot of scratch, you really can’t go wrong with a 2013 Camaro SS. If you are in the market for one be sure to check out on the Internet, the 2014 Camaro SS’s slight styling update, if you like it better than the 2013, you may want to wait until this Fall for the release of the 2014 Camaro SS. If you instead prefer the 2010-2013 styling, then the 2013 Camaro SS is your best bet especially considering in a few months Chevrolet will be heavily discounting the 2013 to make room for the 2014. No words can describe the debt of gratitude that all pony car fans owe to Ford for keeping the Mustang alive during those stretches of very lean years, especially after the Camaro and Firebird went bye bye after the 2002 model year. From 2003 to 2007, for the first time ever the Mustang was the only pony car remaining (even back in 1964, the Mustang had a little competition from the 1964 Plymouth Barracuda). Ford could have taken the easy route and just kept updating the general Mustang body style it first introduced in 1994. There was no need for a refresh, Mustang sales were healthy and there wasn’t any competition. Ford instead doubled down and released the retro 2005 Mustang which was the first Mustang in decades to sweep buyers off their feet. The new 2005 Mustang not only saw increased sales but became one of the biggest automotive success stories of the 21st Century. Without this wildly popular Mustang, Dodge and Chevrolet never would have re-released the Challenger and Camaro respectively. After-all Chevrolet dropped the Camaro at the end of the 2002 model year like it was a modern Vega. And Dodge hadn’t expressed an interest in producing a rear-wheel drive 2-door pony car since its original Challenger was canceled at the end of the 1974 model year. It was indeed the very successful retro 2005 Mustang that brought back these competitors from the dead. Ford has wisely only done mild updates to the Mustang since 2005, currently the 2013 still has the attractive retro styling. Unfortunately the Mustang is now being beaten (not by very much) in overall sales by the Camaro. The gap was widening during 2011 but virtually closed for 2012. For 2013 both are running neck and neck, with the Camaro having a very slight sales advantage, the Mustang may completely close the slight sales gap in the coming months. However with the slightly updated 2014 Camaro due out by Fall, the Camaro will probably widen the sales gap again. Ford has an ace or maybe rotten card up its sleeve for 2015, an all-new Mustang which will ditch the retro styling will debut. It’s a make it or break it opportunity for Ford, if the styling is well received the Mustang may become the pony car sales king again, if not we may be looking at a new era of Camaro sales hegemony. For 2013, the Mustang GT serves another consecutive year as the Mustang that provides the most bang for the performance buck. This modern trend started off in 1982 when Ford re-introduced the GT model after a hiatus of a little over a decade. The formula was a high-performance V8, a well tuned handling suspension, rear-wheel drive, and flashy styling. In keeping with this tradition, all of these are still present with the 2013 Mustang GT. Back in 1982 a 5.0 liter (HO) V8 which produced 157 horsepower and 240 lb-ft of torque was one of the fastest American cars built. In 1982 the "5.0" (liter) badges on the front quarter panels meant this was a series performance Mustang. The same is true in 2013, the "5.0" badges are present in the same location on the Mustang GT and there’s a standard 5.0 liter V8 under the hood. 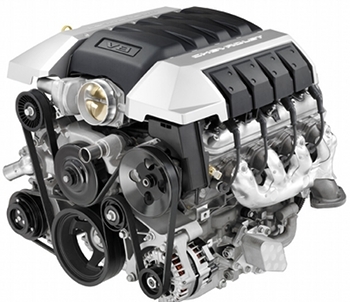 The current 5.0 V8 is a more advanced dual overhead cam 4-valve per cylinder V8 which produces 420 horsepower and 390 lb-ft of torque, the 1982’s 5.0 liter V8 was a 2-valve per cylinder pushrod V8. 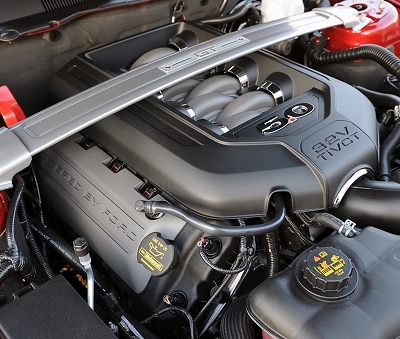 The Camaro SS and Challenger R/T both use modern versions of the 2-valve per cylinder pushrod V8 under their hoods. The Mustang GT is the only pony car to use a DOHC V8. The quarter-mile run takes around 12.7 seconds while 0-60 mph falls right in the mid-4 second range. The Mustang GT on the average is fairly evenly matched with the Camaro SS as these performance figures show. The Mustang has a lower curb weight than the Camaro SS of only 3,618 lbs. Most performance tests comparing the GT and SS have them evenly matched. The SS may be packing more horsepower than the SS’s two ratings show which would make up for the slight lighter weight advantage of the GT. Handling is very good with the Mustang even though it’s the only pony car with a solid rear axle which does put the Mustang at a disadvantage – one that Ford works around with suspension tuning tweaks. When driving the GT, you easily forget there’s a solid axle out in back until the rough pavement is encountered. The current GT’s base suspension yields .92 g on the skidpad. However it’s the GT’s Track Pack package that increases the skidpad number to .96 g (as tested by Motor Trend). To get the handling numbers up to the Camaro SS 1LE’s territory, a perspective buyer will need to move up to the more expensive Mustang Boss, Mustang Boss Laguna, or Mustang Shelby GT 500. The interior of the Mustang GT has a retro yet modern flair. It’s the most appealing of the pony car interiors when compared to its pony car competitors. The twin separate round pod like instrumentation cluster is nothing short of a work of art – not to mention the backlight colors on this cluster can be changed to a variety of different hues making it the best gauge setup of any new pony car. And the overall look of the dash, trim, and seats gives the feel of a modern rendition of the 1969 Mustang Mach 1 which is a very good thing. 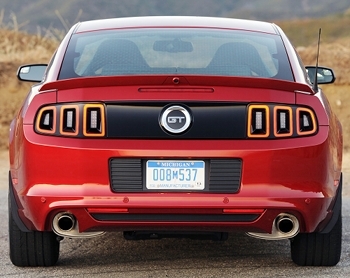 Ford is so much on top of its game with the 2013 Mustang GT, it delivers in both the looks and performance departments. For the base price of a GT coupe – $30,750 to be exact – 420 horsepower never seemed so bargain basement. Next year the Mustang hits the big five-o, it’s hard to believe it has lasted a half of century while the competition has come and gone. With the introduction of the all-new Mustang for 2015 right around the corner, for those that love the modern retro styling of the current Mustang GT, you’re running out of time to buy one of these legendary icons.